In an interview she gave just a few years before she died, Blessed Mother Teresa (of happy memory) told a reporter that she required her sisters to spend at least one hour a day before the Blessed Sacrament in prayer prior to beginning their daily tasks or fieldwork. The reporter asked Mother about HER prayer - after all, readers would surely be interested in knowing how a then living-saint prayed. Mother simply answered. "Each day, I spend this time in front of Jesus in the tabernacle begging him for the grace to stay out of the way of the work of the Holy Spirit." The reporter was shocked. Who would ever believe that someone like Mother Theresa would actually get in the way of God's work? We marvel at Mother Theresa's humility. In each of the last three Sundays, the Church has presented us with our Lord's teaching on the nature and importance of prayer. For example, last week, we heard about the importance of persevering in prayer, in the parable of the insistent widow and the unjust judge. Today, Jesus focuses upon the importance of approaching God in humility when we pray. We have the classic parable of the Pharisee and the tax collector. The Pharisee is a highly respected person in Jewish society: he's well versed in the Scriptures and is probably in charge of the local synagogue. Meanwhile, we have the tax collector - a despised member of Jewish society. Tax collectors worked for the Romans and were seen by their fellow Jews as traitors for they were collaborators with an occupying force. We expect the prayer of the Pharisee to be a model prayer and the prayer of the tax collector to be arrogant and presumptuous. Yet, we see the exact opposite. It's important to note that the reason why the tax collector was humble was because he recognized and accepted his status in the eyes of God. As a fallible creature he saw himself as he was - a sinner. We may ask how often we take pause to recognize and accept this fact about ourselves. Are we more prone, like the Pharisee, to tell God how great we are because of what we have accomplished in life or because of some status we enjoy? Notice that Jesus says that the Pharisee practically prays to himself, congratulating himself for being so righteous. He is self-satisfied with His relationship with God. Sadly, not an insignificant number of Catholics live this way. They reduce Catholicism to being nice to others without any recognition of our need for continual conversion and repentance. There is even a temptation for us church-going folks who have family and friends who don't practice the faith. We can easily look down our spiritual noses with contempt at those who don't come to Mass. That's why Jesus gives us this parable. He wants us to recognize and accept that we ALL need His mercy because we are ALL sinners. Consider for a moment that Blessed Mother Theresa used to go to Confession everyday and the Pope still does. They recognize and accept the reality about who they are - sinners in need of God's mercy. None of us would consider Blessed Mother Theresa or the Pope to be Class-A sinners, and yet they saw their need to approach God in humility each day through the Sacrament of Penance. This is born out of a nightly examination of conscience, asking God to show us our souls as He see things. Yet, our sinfulness should not leave us discouraged. After all, the tax collector, considered by the Jews to be a Class-A-sinner went home justified, which means someone who can be saved. So, there's plenty of hope for us. Our first reading from the Book of Sirach should provide us with much comfort and hope. Sirach assures us that God is not indifferent to the prayer of the one who willingly serves God or to the prayer of those who suffer from any type of oppression or weakness. Sirach makes particular mention of the widow and orphan for a good reason - in the Jewish culture of the Old Testament, there were specific commands in Jewish law intended to protect those most vulnerable to abuse in society - the widow and orphan. Today, we might add the single parent or the unborn child or the terminally ill to that list. And again, our Responsorial Psalm assures us that indeed the Lord hears the cry of the poor. At first, we may easily associate the poor with those who only lack material needs. Yet, it's important for us to expand that definition. The poor come in many forms - the Psalmist says that they are the brokenhearted and those who are crushed in spirit. We could add others - parents who have wayward children; children whose parents are no longer together; those who are mourning the death of a loved one; the terminally ill and their caretakers; the young person who is just struggling along in life; the unemployed; the families of our armed forces personnel. God does indeed hear the cry of the poor - the humble of heart who truly know that they depend on God for every good thing and that their happiness and success is nothing more than a participation in the perfection of God. In the Eucharist, we see how God, in His majesty chooses to remain with us under the humble appearances of bread and wine, even though nothing of bread or nothing of wine remain in the Eucharist. Christ chose to communicate Himself to us under the most basic and humble of means - the one food common to all cultures: bread. And yet, it is no longer bread for us, but the living body of Christ. 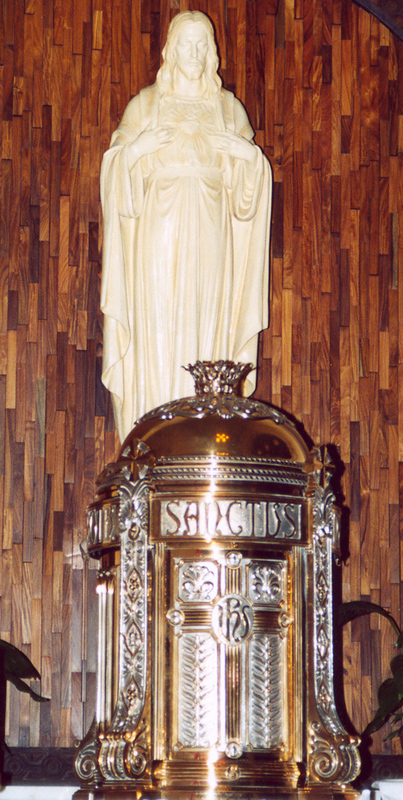 Our Lord sits in this tabernacle and in tabernacles like it day after day and hour after hour thirsting for our love. He is so humble and pure and so vulnerable for our sake. With a God so humble, how can we not return his humility by learning humility in our own lives, especially in our prayer. May we thus approach our Lord in humility when we pray - fully recognizing our sinfulness and our inadequacies and our shortcomings and yet fully trusting in His infinite mercy and compassion and desire for our sanctity. Strong and true to the end, may each of us here today be able to make St. Paul's words our own when he says, "I have competed well; I have finished the race; I have kept the faith. From now on the crown of righteousness awaits me, which the Lord, the just judge, will award to me on that day, and not only to me, but to all who have longed for his appearance."